Made in Aix is a new exhibition of student work from the summer faculty-led study abroad program in France! The exhibit showcases work in different mediums, ranging from photomontage to digital video to drawing and painting; around the mythologies and impressions of Aix En Provence. 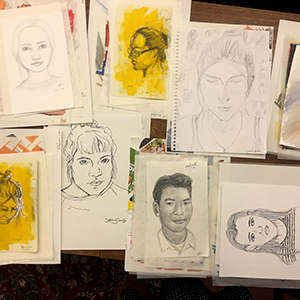 Featured artists at the exhibit included: Stephanie Bradley, Barbara Gonzalez, Cristina Lee, Maddie Air, Mija Pritchard, Samira Rashan, Vivian Reyes, Abraham Romero, Emily Sloan, Ava Giselle, McShall Wong. Visitor parking in Lot 12 in unmarked spaces on levels 3 – 8. Parking is $2/hour. Pay at kiosk at garage entrance or on the 8th floor.